My brothers both had the opportunity to spend a couple of years living in Spain. They lived in different regions and there was a little over a decade between their experiences, but both have such a love for the people, sites, sounds, and flavors of that incredible country. The two will often tease back and forth about which region was better and which part of the country does things right, but they certainly agree that it is a country and a culture that they love and a table full of authentic Spanish food will be sure to keep them happy. Here are a few of their favorites that have become fun favorites of the entire extended family as we have shared them and celebrated. To prepare the herb blend, combine the first 4 ingredients, and set aside. To prepare paella, combine water, saffron, and broth in a large saucepan. Bring to a simmer (do not boil). Keep warm over low heat. Peel and devein shrimp, leaving tails intact; set aside. Heat 1 tablespoon oil in a large paella pan or large skillet over medium-high heat. Add chicken; saute 2 minutes on each side. Remove from pan. Add sausage and prosciutto; saute 2 minutes. Remove from pan. Add shrimp, and saute 2 minutes. Remove from pan. Reduce heat to medium-low. Add onion and bell pepper; saute 15 minutes, stirring occasionally. Add tomatoes, paprika, and 3 garlic cloves; cook 5 minutes. Add rice; cook 1 minute, stirring constantly. Stir in herb blend, broth mixture, chicken, sausage mixture, and peas. Bring to a low boil; cook 10 minutes, stirring frequently. Add mussels to pan, nestling them into rice mixture. Cook 5 minutes or until shells open; discard any unopened shells. Arrange shrimp, heads down, in rice mixture, and cook 5 minutes or until shrimp are done. Sprinkle with 1/4 cup lemon juice. Remove from heat; cover with a towel, and let stand 10 minutes. Serve with lemon wedges, if desired. 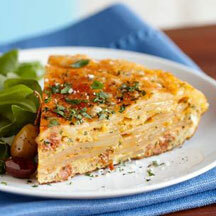 In the deep half of a frittata pan over medium-high heat, cook the chorizo until browned, using a wooden spoon to break it into bite-size chunks, 5 to 6 minutes. Transfer to a paper towel-lined plate. Wipe out the pan with paper towels. In the deep half of the frittata pan over medium heat, warm the olive oil. Add the potatoes and cook, stirring occasionally, until they are lightly browned and almost tender, about 10 minutes. Add the onions and paprika, and season with salt and pepper. Cook, stirring occasionally, until the onions are translucent and tender, 12 to 13 minutes. Remove from the heat and let cool for 10 minutes. In a bowl, whisk the eggs, then stir in the chorizo, the potato-onion mixture and the 1/4 cup parsley. Season with salt and pepper. Set the deep half of the frittata pan over medium heat and pour in the egg mixture. Place the shallow pan upside down on top of the deep pan and cook until the eggs are almost set, about 12 minutes. Uncover the pan and sprinkle the cheese evenly over the eggs. Cover with the shallow pan and cook for 3 minutes more. Holding the pans together, flip the tortilla into the shallow pan and cook, covered, until the eggs are set, 3 to 4 minutes. Uncover the pan and, using a spatula, loosen the edges of the tortilla. Invert a large plate over the pan, hold the plate and pan firmly together and invert the tortilla, cheese side up, onto the plate. Garnish with chopped parsley. Serves 8 to 10. Adapted from a recipe by Michelle Bernstein, Chef, Michy's, Miami, FL. 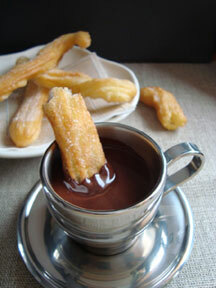 Mix the sugar and cinnamon for the churros in a wide, shallow dish; this is for coating the cooked churros. Churros: Put the flour into a bowl and stir in the baking powder, then beat in the olive oil and 1 cup freshly boiled water. Keep mixing until you have a warm sticky dough, and let rest for about 10 minutes or for as long as it takes for the corn oil to heat up. Heat the oil in a smallish saucepan; it should come about a third of the way up the sides of the pan. When you think it's hot enough, toss in a cube of bread and see if it sizzles and browns. If it browns in about 30 seconds, it's hot enough; or if you're using an electric deep-fat fryer regulate the temperature, it should be at 325 degrees F. Keep a watchful eye on your hot oil pan at all times. Preheat the oven to 175 degrees F. When you are ready, load up a piping bag with a large star shaped nozzle (8mm) and fill it with the churro dough. Squeeze short lengths, approximately 1 1/2 to 2 inches, of dough into the hot oil, snipping them off with a pair of scissors as you go. Cook about 3 or 4 at a time. Once they turn a rich golden brown, fish them out with a slotted spoon or tongs onto a kitchen towel lined baking sheet. To keep the churros warm while you fry the remaining dough. Blot them with paper towels and transfer them to a parchment lined baking sheet. Put the baking sheet into the oven to keep the churros warm. Even if you let them sit out of the oven, they do need 5 to 10 minutes to rest before you eat them, to allow them to set inside. Chocolate sauce: Melt all of the chocolate sauce ingredients in a heavy based saucepan over low heat. Once combined and the chocolate has melted, remove the pan from the heat and set it aside in a warm place. Toss the hot churros into the sugar and cinnamon mixture and shake them about to get a good covering, just before serving. Arrange the churros on a serving platter and serve. Pour the chocolate sauce into individual pots for serving (to avoid the double dipping dilemma) and dip'n'dunk away.